Though Apple is not scheduled to make an appearance at the Consumer Electronics Show in Las Vegas next week, the company is using the event as an opportunity to push its message on privacy and has purchased a large billboard near the city's convention center. 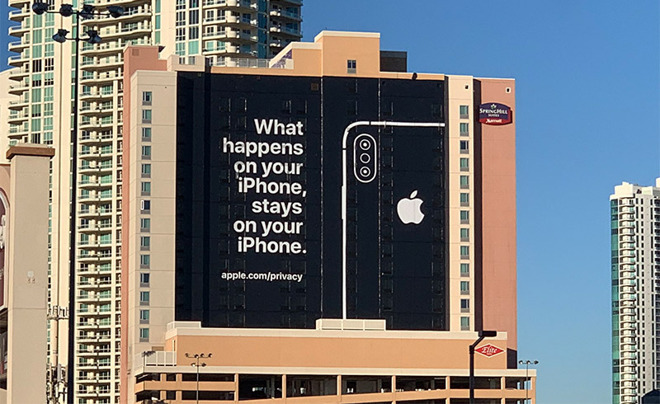 In an uncharacteristic move, Apple plastered a pithy ad touting the tenets of iPhone privacy on the side of a SpringHill Suites by Marriott hotel. The facility overlooks the Las Vegas Convention Center, where throngs of tech industry insiders will gather to network, take in keynote presentations and preview the latest and greatest gadgets. Spotted by Engadget reporter Chris Velazco on Friday, the black-and-white (but mostly black) ad reads, "What happens on your iPhone, stays on your iPhone." The line, a sendup of Las Vegas' own marketing catchphrase "What happens in Vegas, stays in Vegas," is accompanied by a line drawing of an iPhone XS and the address of Apple's privacy webpage. The billboard's location — standing tall over the heart of CES — is likely not a coincidence. Attendees will undoubtedly see the sign on their way to or from the event floor, where companies with less scrupulous privacy policies are set to show off their latest wares. Apple typically refrains from participating in the CES hubbub in an official capacity, though "undercover" employees have been known to prowl the grounds. Instead of taking part in major industry expos, the Cupertino tech giant relies on its own launch events and annual developers conference to shine a light on new products and services. While Apple does not participate in CES festivities, its presence is nonetheless felt through the innumerable accessory makers building products that jibe with popular Apple devices like iPhone and Mac. Last CES saw a boom in HomeKit-compatible products, from light bulbs to obscure integrations like home shower systems.